We all want to be kind, I believe so. 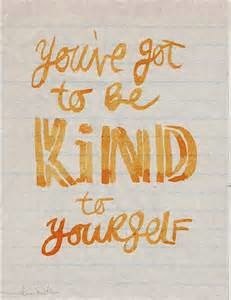 We want to be kind to ourselves. I have often enough questioned the necessity of my own kindness and its ultimate role in who I eventually become or least to mind but worth to take note of, the perception that my peers have about me. I have anyways tried and managed to have a conviction that it helps me a great deal to be kind to everyone. Did it work out in my favor? Surprisingly enough, no. A lot of people out there may relate to me on this that it is the kindest people who eventually end up getting hurt or not achieving “total happiness”. How does one manage to have so much love within him to be so kind and not be happy? It sounds so impossible and if we set the two aspects of “kindness” and “happiness” apart and try to draw a situation where one is kind but not happy, it sounds like total nonsense but I have come to believe that yes, it is possible and it is understandably highly debatable. It is debatable because one can argue that you are either not truly happy or that your kindness isn’t a true character but rather one that is encouraged by a selflessness personality to “meet society’s standards” on kindness and avoid being the grumpy unsociable one. So how did my own kindness shape my own happiness? This is an observation, come conclusion that may be too objective and obviously not necessarily relatable to everyone. So does being kind make me more sociable? Does it bring me happiness? I have sadly concluded no to both questions. The reasons are very simple. One, being kind gives a loop hole for people to use your soft edge as a step stone to get their ways around you. They make you go out of your way to compromise on certain things and this tends to serve a satisfaction to your own hunger of being the sociable one. You eventually lose with a big margin in the race of retaining your true character. Two, for the time that I am able to be kind to people and (sometimes) be out of my own true ways, it does not help me become more sociable because being sociable will eventually requires me to be the realest I can be. This I believe is why all those people who try so hard to befriend every new person they meet, be so kind and sweet are eventually shifted out by the reality of personalities. Friendships are a day to day engagement of true characters. Three, How you take my kindness isn’t of any major concern to me. This should be for everyone out there. We are not paid to be kind, we should not expect rewards for kindness. The reward for kindness done with no expectations and out of will is happiness at heart. This is contrary to my first two reasons but in the end what it will eventually mean is that if one “try” to be kind, they will eventually be hurt because then they are not their true self, if they were, they wouldn’t have to try, they will do it without thinking. “They” that I am referring to could be me and you. So to be happy, to remain who I am without trying so hard to tick off certain character checklist points, I have come to accept that it is normal to not be kind to everyone and that if I am kind, it is not at all going to solely make me sociable or make me happy, on contrary, I may end up in isolation, being unable to fit in because I think it is wrong to rather try to stand out, even in the ugliest postures, standing out remain key. I may end up being sad and depressed because I think my kindness have been unappreciated or that I am overlooked. I am therefore not at all sorry in times that I have acted differently towards those who least matter. Truth is, one can never please everyone in this world. BUT, in the end, please be nice to people, try to build a character that let you do this without trying so hard. Be the kind of person you want to meet and remember, be kind to yourself.